I am relatively new to the field of woodworking and my experience with more complex joinery is very limited, so I appreciate any device/jig/contraption that makes my entry into this area a little more simple. I have seen many different types of doweling jigs out there, but Wolfcraft put together an item that is both inexpensive and very simple to use. 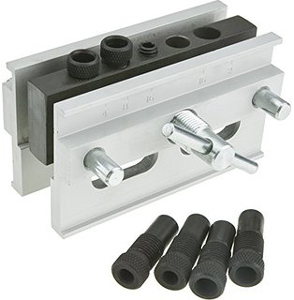 The Wolfcraft 3751405 Dowel Pro Doweling Jig Kit comes with the doweling jig pictured, an extra board clamp to keep the board you are working on level, three drill stops, and a sample package of 1/4, 3/8, and 5/16 dowels. The kit retails for around 30 bucks and can be ordered from Amazon and is usually in stock at Home Depot. What makes this jig so special is that it is designed to allow you to drill the dowel holes in both boards simultaneously. Dowels are not forgiving and any slight misalignment can cause a good deal of grief and can ruin a project. With this jig, alignment problems are not an issue. The jig is adjustable and can handle edge to edge, edge to corner, and t joints. I am working on a project where I needed to create a panel made from big name store bought regular pine boards. I couldn’t use a planer for flattening because I would end up with a bunch of wedges and much wasted wood. As you can see, I used the two clamps that came with the kit and made the boards parallel to each other. I used the small clamp to keep the boards in position so I didn’t have to keep realigning the boards each time I moved the drilling jig. I used a 3/8th brad and the 3/8th stop that came with the kit. The dowels are an inch and a half and the jig thickness was 3/4 inch, so I set the stop at an inch and a half so each board would have a 3/4 inch deep hole. Drilling went fast and easy. The third picture shows the boards dry fitted together with a little gap so you can see how nicely the dowels align with each other. All the holes were even and there was no frustration in placing them together. After glue up, I was able to just sand down any lip where the boards imperfections stood out. The only shortcoming of this jig, and I don’t believe it is a shortcoming just a design decision, is that the jig can only handle boards up to 1 1/4 inch thick. David – Good info. Going to get one soon based on your review. I make signs and people want some in heights of 12” that my local mills can’t always provide in width. I haven’t had great luck with biscuits in glue ups when trying to keep the boards level. Cauls can keep you flat during glue up, but can’t fix a biscuit mismatch. It would seem that the dowels would add more strength than the biscuits. I had tried a slot cutter on my router to cut lengthwise troughs for a connecting thin stock strip, but that needed a lot more effort than I wanted to get into. Do they recommended a distance between dowels for a given length of board? Steve, I tried looking up some recommendations and most of the concerns seems to be geared to dowel corner joints. I think spacing is like 32mm for items like chair rails. Since you would be doing an edge to edge, I would imagine the spacing could be quite liberal, provided the edges were jointed and matched to each other, especially since, with edge joins, glue alone can produce a very strong bond that is at least equal to the strength of a regular board. What I like about the dowels is that you don’t run into that slippage that happens when you just try edge to edge gluing. Glue is a lubricant when first applied and I always had a rough time keeping everything aligned. I am thinking that you route out your signs, so the depth of cut is a concern. In your scenario, I think a dowel on each end of the boards would give you the traction you need, and cauls would keep the boards from bowing out. This would give you the freedom to route in the center without fear of routing down to the dowels. When I did the pine boards example, I edge jointed the boards and even though the boards didn’t have exact matching thickness, the dowels and the cauls kept the edges tight during glue up and gave a much better alignment then if I tried to glue without dowels. dbhost, I promise you that you would find the wolfcraft jig much more satisfying than the one from General. My first doweling project included a quilt rack, pictured here. As you can see, I had some not so straightforward angles to work with. I never drilled a dowel in my life and these offbeat joints came out perfectly and I got it right the first time. I absolutely love this jig. I have one of those jigs too. it’s easy to use once you get the idea. the jig uses two clamps you use one to hold both pieces while the other is used to drill the holes for your dowels. easy to use right out of the box. what a fool i am. i have one of these jigs too – but havent used it. it seems fundamentally different from lots of other doweling jigs and seems to make registration fool proof. anyway, i was going to use it for gluing up panels as well as corner joinery and recently couldve put it to lots of use, but…. forgot i had it in a box stored neatly away! anyway, thanks for the review. this little product needs to get more recognition. paid 29 bucks for mine and I really do like it a lot. Thanks for that review, looks like a nice little jig and looks to work well. Yes, thanks for the review. I too have one of these jigs still in the box never used. How was I to know? Again thanks. Thanks for a very informative review. Not to hijack the thread, but … rather to leave other information here that some may find useful if they search the forum for “doweling jigs,” for example…. Registration will not be as simple as the Wolfcraft, but … I haven’t had a problem yet. Thanks for the additional info Neil. Hijackers welcome :) Good option for thicker boards, which the Wolfcraft would not be able to help anyone with. I would say two jigs would be necessary to have on hand if you go the wolfcraft option. Looks like this would be a great candidate for the second jig. The initial review was very timely as I had to join some boards for a project. I purchased one of these yesterday and have used it twice now. The positives are that this is the first time that I have done dowels to edge joining boards and had them line up anywhere near as good. The fixtures are more than adequate and clamp well. I would recommend this to anyone. I actually had started to shop build the unit, but after costing bushings at $3+ each that brought the raw materials to over $30 and made the buy decision easy. I could have just used hardwood and just drilled the guides, but wanted something to use many times without have to rebuild. First is the design decision to use a slot in the set screw for the drill stop. You need to tighten that set screw and once it goes below the stop surface you need such a small screw driver that that is a risk. I went to the corner hardware and bought replacement allen set screws for under $1 each. Second is the slop in the bushings. Putting the proper drill in the bushing still lets you lean it several degrees in any direction. Since Wolfcraft is European, I am suspicious if the bushing are actually metric with imperial values cast in the fixture. I took the fixture to the hardware store and could put drill bits at least one size larger in each bushing. I am going to stop at Graingers next week to see if a metric size drill fits perfect. Then I’d need to get metric dowels, go figure. Neil – is there slop in your Dowl-it fixture bushings? My first attempt was in 7/16” boards that are below the recommended 1/2” minimum usage. I was using the 1/4” dowels. The one clamp needed a sliver of spacer under it to actually clamp the one side. Due to the bushing slop, couple of the dowels bottoms were visible on the surface. The boards lined up for gluing quite easily. I had to plane the board about 1/8” afterward due to very visible mismatch of the boards. Not going to be able to use the boards, but they were under the tool recommendations. Second attempt was with 7/8” boards and the 3/8” dowels. This worked quite a bit better. I took care to keep the drill at 90 degree to make up for the bushing slop. Alignment for dry fit was good and gluing went fine. Extremely minimal mismatch this time. Don’t know if 3/8” is closer to metric size or my attention to the drill orientation made up for it. My local orange and blue big box stores didn’t carry it, so I decided to go to Wolfcraft online to see where they were. Initially I found the European site which only showed retail places in Europe. Then found a US Wolfcraft site that is essentially a marketer and had no search option for stores or any way to find retailers that carried their products. So off to Woodcraft site which didn’t find it right away. Local (30 miles) Woodcraft had it and that is where I got it for $39. The box. It come well packaged, but there are a number of loose pieces and the box isn’t set for use in the shop. Box opens on one end rather than on a side, which requires dumping out the pieces each time. Going to get a HF plastic box for it. And like most items, it is made in China. Steve: excellent additional info! Thanks!! As to slop in the bushings: not that I’ve noticed. The only issue I had was one of pure user error. The set screw is hex, and I simply wasn’t tightening it down quite enough. Rather than slop in the bearings, that left slop in the central section of the jig … where the bushings live. After solving that minor issue (which wasn’t addressed in the instructions), I’ve been golden, with excellent registration and easy use. yeah, thanks for all the extra info, guys. i’ll have to watch for the bushing slop when i use mine. Hey Steve, thanks for the additional info. I did some research on the wolfcraft jigs and there are actually two out there. One is the version I currently have and gave my initial review. You can find it on Amazon here. Just for verification, I also see a Universal doweling jig that is very similar and is made by wolfcraft but is in metric form. A UK site posted this version here. They are close but there are some subtle differences. I only ask because I did not have the slop you noted on my jig. I did have the same slot screw in my drill stops as you noted, but it really didn’t cause me much annoyance so I did not mention it. When you are wrong, you are wrong and need to set the record straight. Seems I am not as high a wattage rating as a simple HSS drill bit. This morning I took the second glue up out of the clamps and was amazed at how perfect the alignment was. Couple light strokes with a small plane to remove the glue and the joint was almost invisible or able to feel any mismatch. This made me question my view of slop in the device during use. First I took my wixey and determined the angle which showed 2 degrees potential movement from right to left. That was on line with my slop observation, but not what I was seeing with the joint. Second I took my drill bit set and found two drills that would fit side by side without any gap in the 5/16” fixture. I measured the two drill with digital caliper and added them up to 0.310”. Then I measured the shank of my 5/16” drill bit using same calipers and found it was 0.310”. So I started measuring the drill in several places and found my error. At the cutting edge the drill was 0.310 across the drill and at 90 degrees to the cutting edge it was 0.298” across the drill bit. There is a designed in lip angle leading to the cutting edges on a drill. It was that smaller diameter that gave me the slop impression. In actuality, once the drill starts turning it centers in the guide and is precise. So, three thumbs up on the product and it is going to be my friend for some time.